This book is just packed with innovative ideas and interesting ways to use fabric and fiber. 30 projects for home décor and fashion accents. Yarn arts and felting are two of today’s most popular crafts, and popularity for weaving, a natural extension of those crafts, is growing. 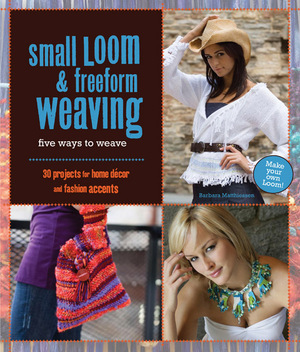 Small hand-held looms and tabletop looms are now available at yarn shops and hobby/craft stores, and readers of Small Loom and Freeform Weaving can even construct looms themselves using common household materials. Most looms can be constructed in a couple minutes and can be reused numerous times. This book also shows readers how to use their looms to make 30 projects, some of which can easily be completed in an evening or weekend. Readers will enjoy step-by-step, diagrammed instructions for personal items, such as iPod and cell phone holders, scarves, purses, and jewelry, and home décor projects, such as pillows, table runners, wall hangings, and book covers. With the sunny days upon us I thought it fitting to share with you this cool woven eyeglass case that is made from strips of fabric! Incidentally it would make a great Mother's Day gift, don'tcha think? 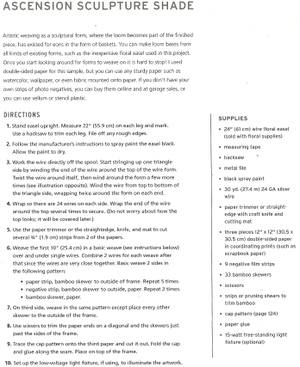 Click on the image to enlarge and read how to weave an eyeglass case from strips of fabric. I have been weaving since I was a kid. I probably was even crafting in the womb, I'll have to ask my mom about that one on Mother's Day. She'll giggle. One of the things I made was those pot holders with the stretchy loops. I scored a loom and some loops at a thrift store recently and made one again with the supplies that came in the box. Always one to recycle and seeing the eyeglass case inspired me to look around and see what I could get some stretchy loops out of. The sleeves of a t-shirt looked like they might work. So I cut some loops out of the sleeve of a t-shirt about 3/8 of an inch wide and went to town loading up my loom. Here is the loom all full. As you can see I had to make the hook that is used to draw the loops through out of some wire I had around. Here is my finished pot holder and just for fun the one in the middle was the one I made with the loops included in the kit I got at the thrift store and the one on the left is one I made as a kid. These are just a few of the patterns you can make. And now back to eye glass cases. I folded my t-shirt loop pot holder in half and it holds a small pair of sun glasses or reading glasses just great! Do you still do the same crafts you did when you were a kid? or have you evolved into other things? Tell us what you did as a kid and what you do now. As a thanks for sharing you'll be entered to win a free book! They are our latest 4 winners of a free book! Keep sharing those answers- I don't know about you all but I have picked up a few cool ideas and laughed a bit too! My green project today embibes the color of the day, is green literally and in the spirit of eco-friendliness! The inside peek was of a woven lamp. I was sorting through some stuff and I found a cool wire lampshade frame and I thought it would be cool to weave yarn scraps through it. Can you tell I knit and crochet with a lot of different greens? It was so easy. I started at the top of the frame and tied one end of the yarn to one post. I then wove the yarn over the next post and around once the next. I repeated this around the frame using each yarn as long as it would go all the way back to where I started so all the knots would be on the same post. What are you crafting or designing utilizing any of the meanings of "green"? Oh and if you need a bit of inspiration pop back to last year's St. Patty's Day Post. I love a book that teaches you how to make projects and teaches skills but this one also teaches you how to make the tools to create the materials that you then make the projects with! And the projects in this book are diverse, classic and extreme! Something truly for everyone. Five Ways to Weave I picked this lamp, yes a lamp! And the even bestest part about this lamp, other than it's woven of course, is that the frame is a floral easel! I think that is so innovative. Barbara Matthiessen had a specialized degree from an interior design school and experience working for a design firm before she entered the industry as a full-time freelance designer. She has written 43 booklets and 3 books, contributed to 22 multi-artist books, and has done countless designs for magazines. While continuing to design for publication, she also works for manufacturers, developing kits, projects sheets, and sales models. 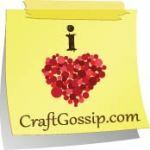 And as promised-The Crafty Blogger Links! Browse through photos of home-made greeting cards and submit your own. Stitchers - Start Your Stockings! 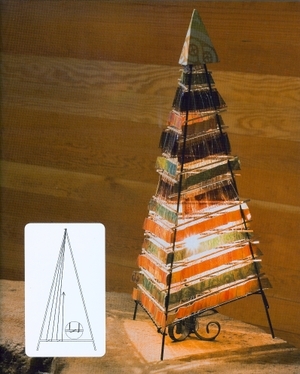 It is never to early to start on holiday projects, but don't wait too late. This week Aileen offers 2 fun tutorials: Phenomenal Paper Flowers & Wee Flower Fairies. Both are sure to inspire you and make you smile! Get a free metal clay project over at the BeadStyle blog. This downloadable project shows how to make some super easy metal clay beads! Have you ever wanted to try creating an abstract work but found it too intimidating? Come and try it anyway! Learn the anatomy of a polymer clay bead this week. Madge reviews a fabulous new metal clay book by jewelry making expert Tammy Powley. If you've ever been metal clay curious, this is the book for you! Decisions, decisions! Why not try a little of everything!